• Competitive landscape from a patent perspective, offering a very complementary vision to market research. • Key patent owners, their IP and technology strategies and their future intents. • New entrants, their technology and their market areas of interest. • Follow technology developments, identify emerging technologies and know key technical solutions to solve hot technical issues. The 2016-2018 period has been crucial for the whole SiC industry. SiC MOSFETs, commercially available for several years, are gaining the confidence of numerous customers and have clearly begun to penetrate into different applications. They follow the first commercially available SiC diodes that appeared on the market over 18 years ago and gradually changed the market. According to Yole Développement’s report Power SiC 2018, the SiC device market is expected to grow steadily, from $302M in 2017 to more than $1.5B in 2023, at a Compound Annual Growth Rate (CAGR) of 31%. In this report, Knowmade has thoroughly investigated the patent landscape related to SiC-based power electronics, covering MOSFETs, Schottky Barrier Diodes (SBDs) and power modules. Today, there is a dichotomy in power SiC patents, with new activity from Chinese players on one side and leadership of Japanese players and the strong presence of automotive companies on the other. 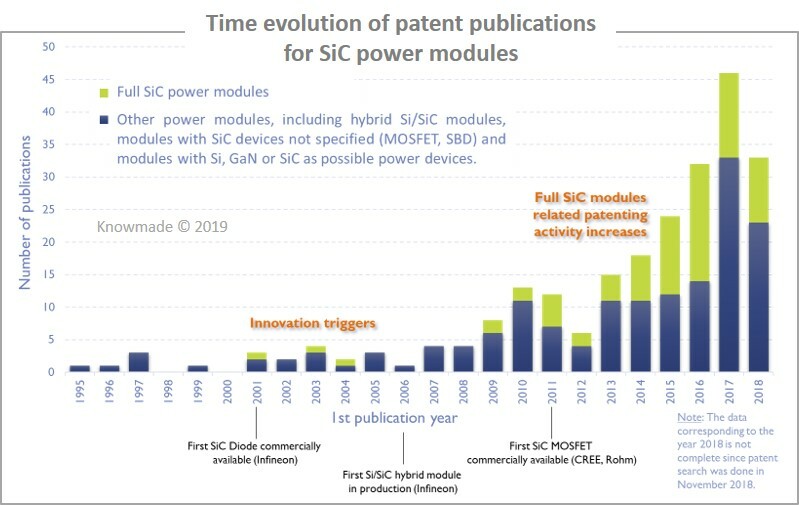 We witnessed a remarkable acceleration in patent filing related to SiC MOSFETs between 2011 and 2015, concomitant with the commercialization of the first SiC MOSFET products. 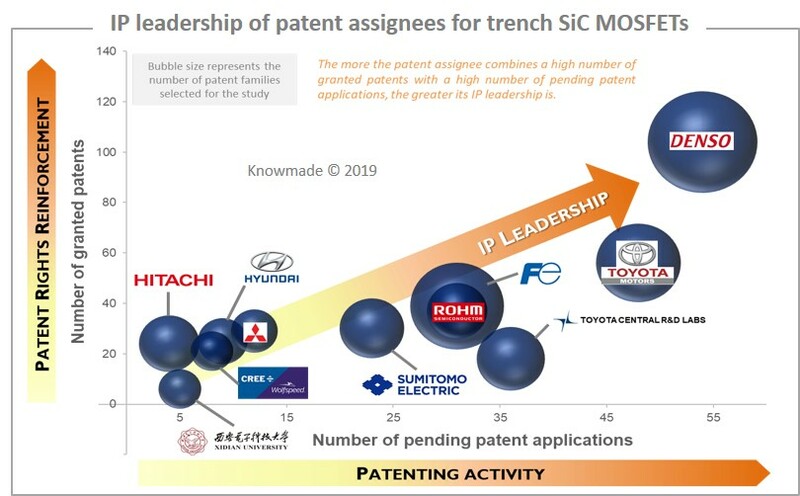 Japanese integrators – especially Denso and Fuji Electric – have taken the lead in SiC MOSFET related patenting activity. China has entered the SiC MOSFET patent landscape in recent years, starting with R&D players in 2011, who were followed by major state-owned integrator companies in 2015 such as State Grid Corporation of Chine (SGCC), CRRC and SiC pure player foundry Century Goldray, which was established in 2010 to address the whole power SiC supply chain. A common feature of these new entrants is that they intend to develop IP on both planar and trench MOSFET structures. Taiwan has a long standing R&D player in SiC MOSFETs with ITRI, but there was no industrial player until 2016, when Hestia Power emerged, focused on cost effective planar junction barrier Schottky (JBS) diode-integrated MOSFET structures. We note that current leading SiC device makers like Cree/Wolfspeed, Rohm, Infineon and STMicroelectonics own some key patents but do not necessarily have strong IP leadership. CREE/Wolfspeed has taken the lead in the planar SiC MOSFET IP race, well ahead of its main competitors Mitsubishi Electric and Fuji Electric. The analysis of Cree’s patent portfolio shows it can effectively limit patenting activity in the field and control the freedom-to-operate in most countries including Japan. In fact, patenting activity from competitors is not ramping up and does not threaten CREE’s IP leadership. The strong leadership of CREE/Wolfspeed as well as the growing maturity of planar SiC MOSFET technology could explain a slowdown in patenting activity since 2015. Denso leads the IP race in trench SiC MOSFETs, well ahead of Fuji Electric. However, the latter could seriously challenge in coming years, provided that a significant number of its pending patent applications are granted. The situation differs from planar SiC MOSFETs, with various patent applicants such as Toyota Motor, Toyota Central R&D Laboratories (CRDL), Sumitomo Electric and Rohm still active. 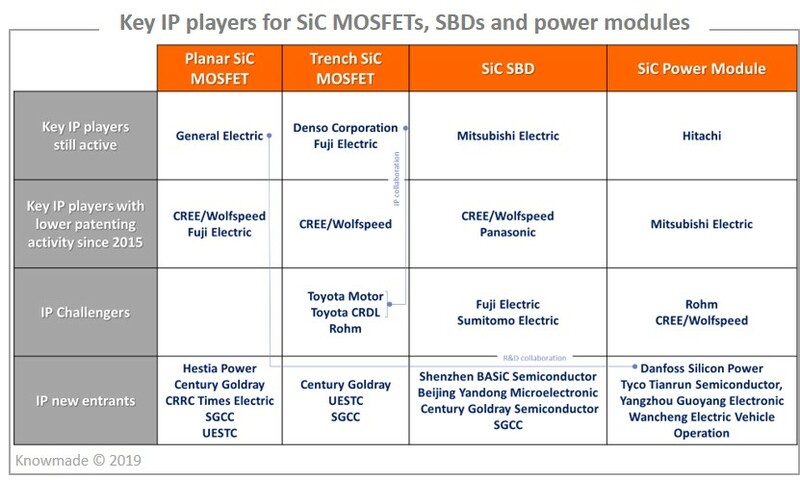 There seems to be more room for challengers in the trench SiC MOSFET IP competition, although Denso is actively strengthening its leadership through the collaboration with Toyota Motor and Toyota CRDL in the context of the acceleration of SiC power technologies’ development for electric and hybrid electric vehicle (EV/HEV) applications. CREE/Wolfspeed’s IP portfolio is relatively small in trench SiC MOSFETs with respect to planar SiC MOSFETs, but the company owns several key patents as it started to patent important inventions before most competitors. A significant fraction of patents related to trench SiC MOSFETs concern the protection of the gate oxide material from electric field concentration in certain portions of the gate. In this report we go through recent developments from major IP players to address reliability issues due to gate oxides. The share of full SiC module-related patents has been growing since 2012. Mitsubishi Electric is leading the SiC power module IP race with key patents mostly focused on hybrid Si/SiC modules. In this report we detail the patent portfolio of the main IP leaders like Mitsubishi Electric, Hitachi, Rohm and CREE/Wolfspeed and the new entrant Danfoss Silicon Power. Rohm’s recent patenting activity puts the emphasis on the use of full SiC modules in electric vehicles, stressing solutions to efficient heat dissipation, the reliability of power module assemblies operating at high temperature and the reduction of stray inductance. Danfoss filed four patents related to full SiC MOSFET modules in 2018, focusing on enhancement of performance through optimized layout of interconnects inside the module.